The MBA experience is different from traditional university studies in many crucial aspects: the opportunity to tailor your pathway as you like; a diverse community and extensive exposure to challenging management assignments which require excellent multi-tasking abilities. In fact, opportunities for development are not bound to the school or even the University of Cambridge. One of the highlights of my MBA experience so far has been participation, with a small team of Cambridge MBA students, in the Private Equity Case Competition, organised in Amsterdam by the Rotterdam School of Management. 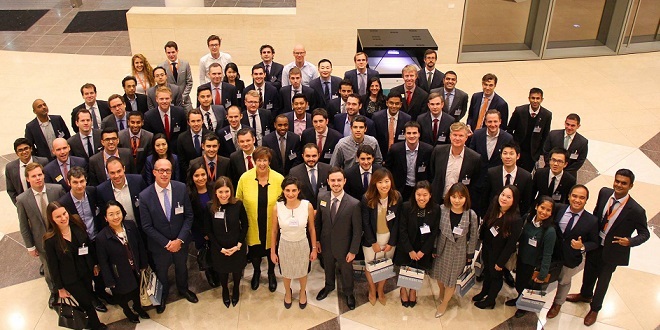 The competition was not only an excellent opportunity to challenge ourselves and learn a bit more about private equity, but also to network with students from other top MBA programmes. The competition was an excellent learning environment, where we were able to apply knowledge from our MBA courses in Corporate Finance, Accounting and Quantitative Analysis (Management Science). It was also a chance to gain valuable experience of working on a real business case in a harsh private equity setting, practise team leading and teamworking in a diverse team (Russian, Brazilian, American, British Indian, Swiss) as well as demonstrate and enhance our presentation skills. While preparing for the competition, we received a lot of support from the Cambridge MBA community. For example, even though some concepts needed for cracking the case were clearly related to courses scheduled later in the MBA programme, we received some excellent support from the Cambridge MBA faculty. Secondly, when we asked our MBA cohort if we could rehearse our presentation in front of the class, we got a large amount of excellent feedback, and despite it being busy time on campus, our classmates did not hesitate to invest their time to help us improve on our deliverables, showing the amazingly collaborative Cambridge MBA environment in action. Finally, for me, it was a lesson in multitasking; case competitions complement the core curriculum but in no way substitute it. Incidentally, preparation for the Amsterdam trip coincided with the active phase of the Cambridge Venture Project (CVP) and it definitively contributed to my ability to conduct several totally unrelated projects with completely different teams (I encourage you to read the blog about our CVP experience with Cambridge Rowing written by Aurelia Kassatly). Though only one team can win a particular competition, everybody benefits from the experience. for that reason, I would heartily recommend everybody uses extracurricular opportunities to broaden their horizons and supplement in-class studies with competitions. You gain hands-on learning and have fun while also marketing yourself in the global arena.